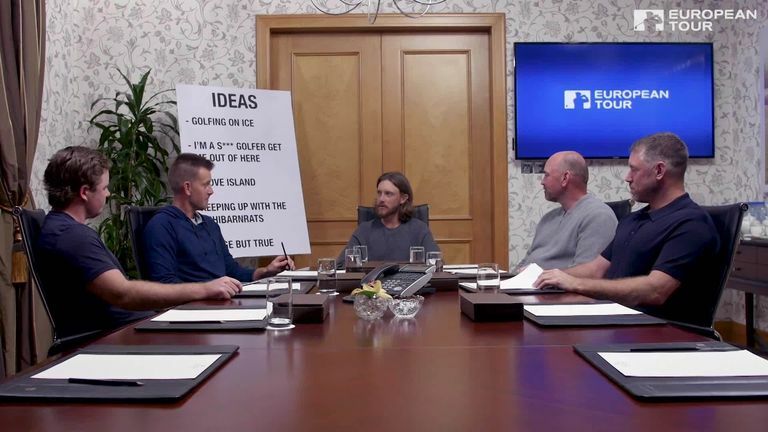 Tommy Fleetwood, Henrik Stenson, Thomas Bjorn, Lee Westwood and Eddie Pepperell star in a hilarious meeting to discuss viral video ideas for the European Tour. Five European Tour stars got together in Abu Dhabi to discuss outrageous ideas for viral video content, and the results are hilarious. Tommy Fleetwood chairs the meeting of "The Content Committee", with Ryder Cup captain Thomas Bjorn, Henrik Stenson, Lee Westwood and Eddie Pepperell all offering a range of ideas in another superb production from the European Tour team. Fleetwood explains that the players were fed up with being asked to take part in various sketches by "media types", so they decided to come up with the ideas themselves. "Glove Island", "Keeping up with the Aphibarnrats" and "Golfing on Ice" were among the initial considerations, while Stenson was keen to have cats playing a piano and also chipped in with "Monty's Pythons"! The brainstorming session was captured on camera, so click the video above to see the results for yourselves. And if you've got your own ideas for golf-related viral video content, get in touch below. But please adhere to our House Rules. If you wish to report any comment, simply click on the down arrow next to the offending comment and click 'Report'.